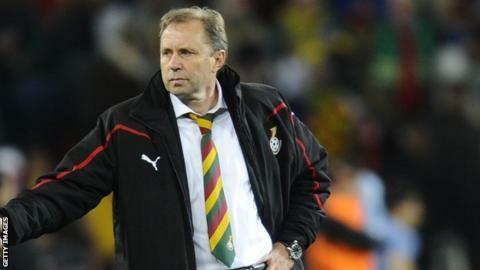 Milovan Rajevac is being tipped for a return to the Ghana coaching set-up after being named on a three-man shortlist to be technical adviser. Current coach Kwesi Appiah nominated Rajevac for the post after they worked together from 2008 to 2010, when the Serbian was in charge of the Black Stars. Another Serbian, Radmilo Ivancevic and Danish coach Ove Pedersen are the two names being considered. The technical adviser will work with Appiah to "steer the national team in the right direction" according to the Ghana Football Association. The decision was taken by the GFA after the Black Stars failure to get past the group stages of the World Cup in Brazil. Rajevac is seen as the most successful foreign coach to have worked in Ghana. He lead the Black Stars to the final of the 2010 Nations Cup in Angola and later that year to the World Cup quarter-finals in South Africa. After choosing not to extend his contract after the World Cup he was considered for the Egypt coaching post in 2011, with the job eventually going to American Bob Bradley. Appiah also suggested former Ghana international, coach and football association boss Ben Koufie for the role. But the three man committee charged with choosing the technical advisor rejected the proposal because they did not feel that Koufie, who is in 80's, could cope with the demands of the job.